Why the new superannuation proposals? First Home Super Saver and Contributing the Proceeds of Downsizing to Superannuation. The government has finally put to Parliament its proposed legislation around two of its proposed schemes, the First Home Super Saver and Contributing the Proceeds of Downsizing to Superannuation. This legislation is an attempt to bring into action proposals from the 2017 federal budget. assist retirees to use some of the money from downsizing their living arrangements for superannuation. The First Home Super Saver may sound a little familiar; the ALP introduced a similar scheme under the Rudd government that the Coalition opposition opposed. In fact, proposals to use superannuation for housing go back as far as 1993 when Paul Keating put up the idea of all Australians being able to use up to $10,000 of their superannuation for housing. This idea has been constantly raised by those who may not fully understand the policy intent of superannuation. The second proposal is a little more novel; the government believes that many retirees are not selling their existing homes and downsizing to a more livable space due to the new contribution caps. It is hoped the proposal will encourage retired Australians to downsize their home, offering those homes to the market and thereby increasing the supply of dwellings (and hopefully putting downward pressure on house prices). However, as the amounts transferred will count towards pension tests, some retirees may choose not to jump at the idea. If you are a retiree and considering this option, feel free to contact us to identify its effectiveness for you and the impact, if any, it could have on your government pension. The budget proposed that from 1 July 2017 eligible first home buyers would be able to contribute up to an extra $15,000 per year, up to a total maximum of $30,000, into their superannuation that would then be able to be released if used to buy a home. However, the contributions still count towards the annual concessional and non-concessional caps and are not in addition to those caps. Eligibility is limited to those aged 18 and over who have not used the FHSS before and have never owned real property in Australia. If you are purchasing with another person who already has property, you would not be disqualified from using the FHSS. However, there can only be one request for a release of the amounts held in superannuation. If you withdraw less than the total $30,000 plus earnings in an initial release you cannot later seek to withdraw further amounts. To assist older Australians to downsize their living arrangements. the property sold must have been held by the person for at least 10 years and been their principal place of residence for that period. the property must be in Australia and cannot be a houseboat, caravan or other mobile homes. the contribution must be made within 90 days of the disposal of the dwelling, or such longer time as allowed by the Commissioner. the individual must choose to treat the contribution as a downsizer contribution and notify their superannuation provider in the approved form of this choice at the time the contribution is made. the individual cannot have had downsizer contributions in relation to an earlier disposal of the main residence. You can contribute up to $300,000 from the sale of the home as a non-concessional contribution into superannuation savings. The amount is $300,000 per person, so a couple seeking to use this measure will be able to contribute up to a total of $600,000 out of the sale of their residential home. The new rules apply to the proceeds of contracts entered into on or after 1 July 2018. Downsizer contributions are not tax deductible and can be made for an individual in relation to one sale of the main residence. Further, downsizer contributions cannot be made in the future in relation to the sale of another main residence. Therefore, if you sell your house at age 65 but only contribute say $200,000, if you later sell an eligible home you will not be able to contribute any of that to make up the amount not initially contributed. However, you can make multiple contributions (up to the cap amount) from the sale of the same residence. 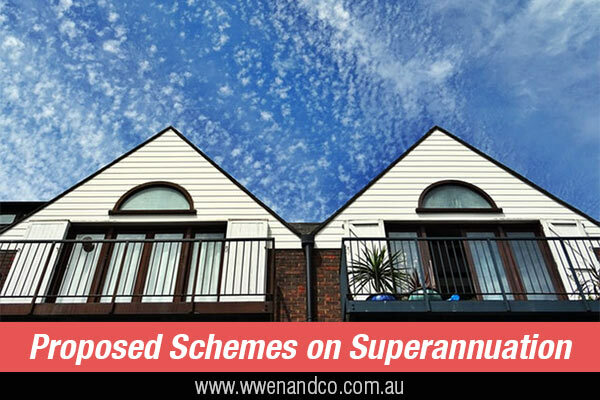 While the amount from selling the home under the scheme is limited to $300,000, there is no restriction on the person making other contributions from the sale of their home into superannuation. These further contributions will however not be under the scheme and be subject to the contribution caps. In order to encourage people to take up the scheme, the contributions eligible under this proposal will not count towards the new contributions cap. This will be a relief for many who may be considering downsizing through this process. What if the property was owned in the name of one spouse rather than both? In this circumstance, the spouse who is not on the title would still be able to claim the ownership period with their spouse. Similarly, an individual person may gain the title in respect of a dwelling following the breakdown of a relationship. In such cases, the person who ends up with the title can count the period of ownership with their former spouse towards the 10-year ownership test. The amount may relate to proceeds from the sale of a business (including a farm) where the owner also lives on site and it is the owner’s main residence. There is no need for the proceeds of the sale to be apportioned so that only the capital proceeds relating to the sale of the owner’s main residence are able to be used to make a downsizer contribution. Another advantage of the proposal is that it will not be subject to the work test or an age limit. If this were not the case, it would severely undermine the advantage of the proposal. Normally, contributions in this age group are required to be made from a person gainfully employed for at least 40 hours within a 30-day period during the year. Furthermore, the restriction on those over 75 making a contribution are removed if the contribution is made through this process. One factor that may restrict the benefit of this proposal, and thus play on the minds of older Australians on whether to sell their homes, is that the contributions will still count towards total pension assets tests. This means that older Australians will be moving funds out of an exempt asset (their home) into a non-exempt asset. Currently, you can have up to $350,000 in non-exempt assets and still be eligible for the full pension. If you sell the house and contribute up to $300,000 into your superannuation, then this will increase your nonexempt assets by $300,000, and this is likely to cause a reduction in your government pension payment.